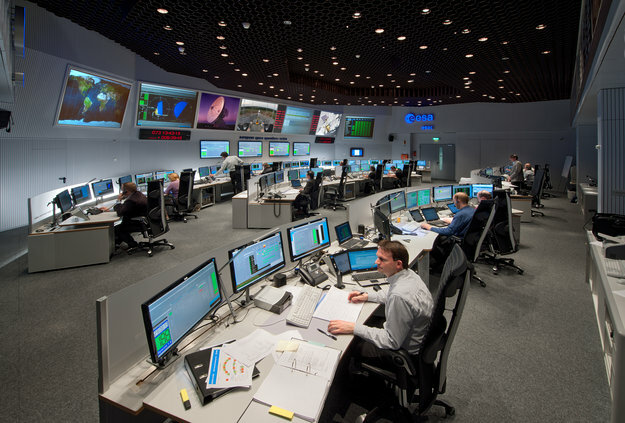 The European Space Agency Satellite Control Center in Darmstadt, Germany (Credits: ESA). I have the privilege of working in the space industry as a power subsystem engineer for Orbital Sciences in Gilbert, Arizona. On February 11, 2013 the Landsat Data Continuity Mission (aka Landsat 8) spacecraft was launched and I was at the NASA Goddard mission operations center monitoring performance of this satellite that Orbital built for NASA and the US Geological Survey. There is a lot more to getting a satellite launched and working than just bolting it to a rocket and flinging it loose. Once the satellite is in orbit, it’s not ready to use on the first day. Engineers and operators need to slowly and carefully activate and test out all of the equipment and operating modes. Spacecraft are generally launched in mode with only a few components operating, the minimum needed to maintain proper pointing and communication with the ground. This is done in case of any problems with the rocket or deploying of solar arrays and antennas. Over the first few days more components are turned on, and software settings and parameters are adjusted as these changes affect the operating modes. The spacecraft is checked out between each step, and since the ground is not in constant contact with the spacecraft, this can take many days. After the spacecraft bus is checked out, only then can the payload (science instruments) be turned on. This is also a slow and deliberate process, as you don’t just flip one switch for data to start flowing. The entire process of controlling (“flying”) the satellite is rather complicated. There are pass plans, software loads, guidance parameters, communication channels, and many more details that I haven’t even figured out. That’s how the space hardware business generally works – everyone is a specialist. Most of the engineers know a whole lot about one particularly specialty. Mine is the power subsystem – the solar array, battery, and charging and load switching electronics. I know a tiny bit about the software and data system, but not many details. Likewise, the folks who manage the thermal control generally don’t know all the details of how the solar array is designed. This makes it a team effort, which is very cool, but requires a lot of coordination, management, and planning. Even sending a single command is not trivial. You have to test it on a ground simulator to make sure it works, then load it in a communications queue, then format it to send by radio to the satellite, then confirm it is received, then confirm it did what you asked. This goes on and on and on for every little setting, such as heater set points, communications channels, etc. Driving satellites is a team effort that takes a lot of planning and smarts. Once a new satellite is checked out and it starts its main mission, the staffing level goes down from several dozen to a handful, and often after a year or so, maybe one engineer checks on it once a day and leaves it on a sort of auto-pilot, with the scientists (who are collecting the data) commanding data collecting sequences. One reason I am describing this complexity is that there seems to be a perspective that spacecraft and space travel should be simple and inexpensive. The truth is that even sending simple commands to an unmanned satellite requires a full team of engineers. If you look at photos of SpaceX’s control room for the recent Dragon resupply mission, you will see that there are at least a couple dozen people involved. Space technology is still complicated and that makes it somewhat on the expensive side. That’s simply the reality. – By Michael Mackowski– Opinions expressed are those of the author and do not necessarily reflect the views of Space Safety Magazine, the International Association for the Advancement of Space Safety, or the International Space Safety Foundation. This article is published courtesy of Moonandback.com.